My children love magazines and are always lured by the toys on the front cover so when we received the brand new DC Super Friends magazine their eyes lit up eager to see what was inside. DC Super Friends is all about the world’s superheroes such as Batman, Superman, Green Lantern, The Flash and many more along side their baddies. The magazine is primarily aimed at young boys between 2-5 years old and every issue comes with a free toy. The first issue comes with two communicators with switching screens which you can turn over to show different characters. Mister B was immediately drawn to these and couldn’t wait to pretend talking into them and spent the rest of the day carrying it around. 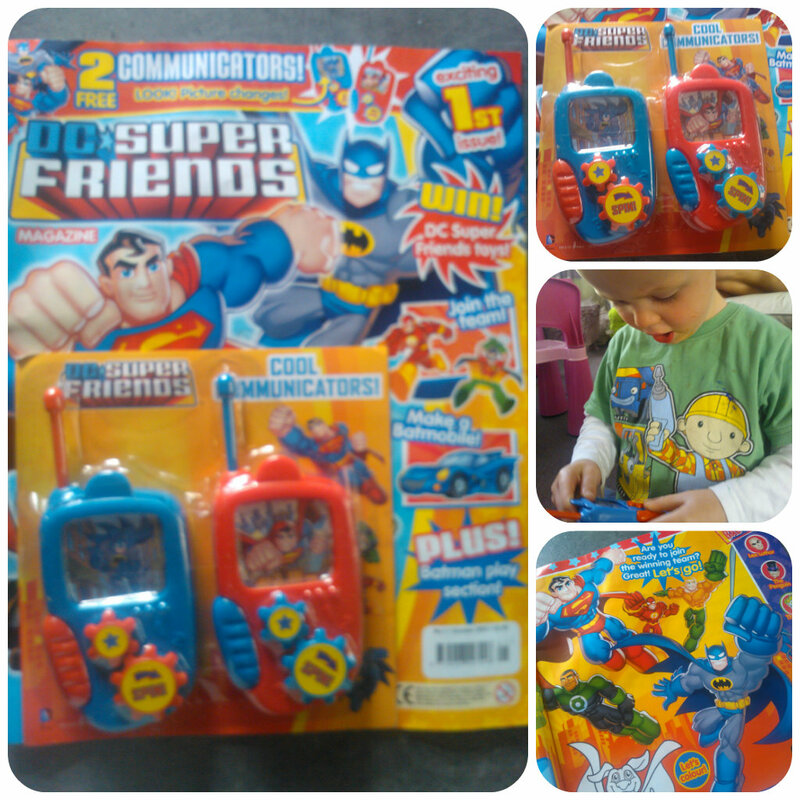 The DC Super Friends magazine is full of activities including a story, colouring in, observational puzzles, spot the difference, code puzzles and much more. There is also a making section to create a Batman mask and Batmobile by cutting and sticking onto card – great for little ones that love to make – I know my children do. I think this magazine contains a great variety of activities for little ones to do, inspiring their imagination and lots of quick fire questions and observations to keep them alert and thinking about things. Mister B was fascinated by all the super heroes, Batman being his favourite the moment. He loved spotting Batman’s logo as we went though the magazine and asked me what others were that he didn’t already know. 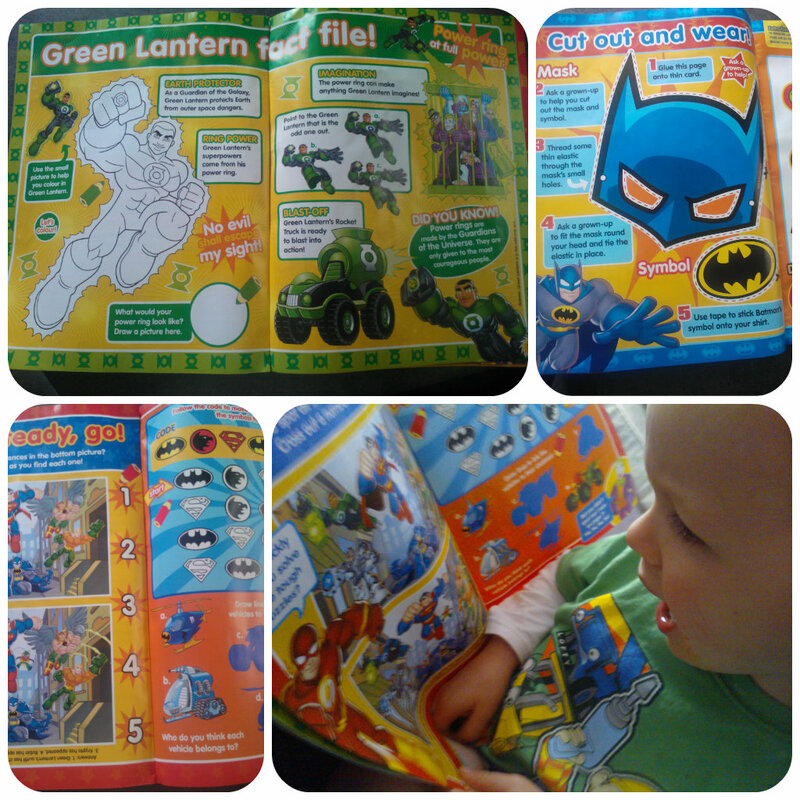 He also liked the page discussing colours and he went through each superheroes outfit telling me what the colours were. Overall I think this is a lovely magazine for young boys, although at the younger age they will require supervision to complete this, but for me it is a nice activity for me to sit down and help Mister B with. There’s also a couple of competitions included which you can get involved in to win superhero prizes so if you fancy trying a copy with your children when the DC Super Friends magazine goes on sale in the UK on the 19th September 2013 which you can find in supermarkets and newsagents. Good discounts are available for subscribers, details of which can be found at www.titanmagazines.com/superfriends and within the magazine itself.